VedicMaths.Org - Issue 91 - How 'Vedic' is vedic Mathematics? This issue’s article is written by Kenneth Williams and discusses the validity of the use of the word ‘Vedic’ in Vedic Mathematics. 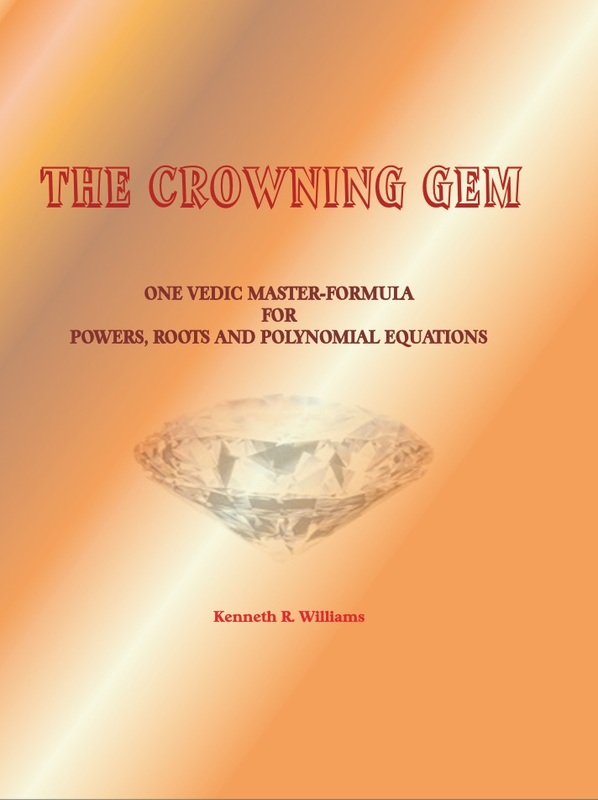 This new book by Kenneth Williams shows a beautiful, unified and comprehensive approach to finding powers and roots of numbers and solving polynomial equations. It uses an application of the Vertically and Crosswise formula, which means all these solutions can be found with great ease using a single elegant pattern. 1) Introductory Certificate Courses, 4-weeks: starting 5th January, and 6th April. 2) Diploma Courses, 5-weeks (follows on from the certificate course): starting 9th February, and 11th May. 3) Advanced Diploma Course, 6-weeks (for those who have completed the Diploma or Teacher Training Course): starting 23rd March. 4) Teacher Training Course, 9-weeks: starting 5th January (tentative date). Courses are from Pasyanthi Academy of Holistic Sciences, E-gurukul and the Vedic Maths Academy. It is a great pleasure to announce that the Vedic Mathematics Teacher’s Manual (already available in 3 languages) will very shortly be available in Hindi. Since this is the main language of India, from where the reconstruction of Vedic Mathematics originates, it is particularly gratifying that this book will now be available for free in India and elsewhere. With more certified VM teachers being trained it is proposed to create a directory of such teachers. In this way it will be easy to put qualified teachers in touch with students. The location of this resource will be announced when it is available. “APPLICATIONS AND CHALLENGES IN VEDIC / ANCIENT INDIAN MATHEMATICS"
This is the main theme of the 5th International Vedic Science Conference to be held at Bangalore, 20-22nd December 2013. We know that Dr Rajiv Babajee will be giving a presentation related to his new book “Vedic Mathematics Proofs” (http://www.vedicmaths.org/14-vedic-mathematics-proofs). “The psychology of Vedic Mathematics - Examples of universal thought patterns”. “Powers and Cyclicity” by Debasis Basak shows how to get the last digit and last two digits when raising any number to any power. “Observations from ‘Figuring’ by Shakuntala Devi” by Sarwan Aggarwal. This article notes and discusses some connections between this book and Vedic Mathematics. “One line method for calculating digits to the 3rd, 4th ,5th , 6th and 7th” power by Stephen Mogomotsi Modisane of South Africa. This extends Bharati Krsna’s method for squaring and cubing near a base number. If there is a VM teacher in the Boston area of USA please contact us on . There is another teacher who wishes to collaborate. This free course: ‘Vedic Mathematics, Science and Technology Discipline’ can be accessed at www.vedicganita.org where you will need to register. How ‘Vedic’ is Vedic Mathematics? The system given by Sri Bharati Krishna Tirthaji and known as “Vedic Mathematics” is sound mathematically, but there are those for whom the name creates extreme mental reactions. How can it be called ‘Vedic’, they say, when these sutras are not in the Vedic texts? In this article the answer is reiterated: that ‘Veda’ does not just refer to a set of writings from ancient times but has a much wider meaning. It is clear from this that the word ‘Veda’ is not considered as confined to written texts. At a press conference on 11 August 2004 with Maharishi Mahesh Yogi, a reporter at The Washington Post asked Maharishi to explain the term Vedic. Maharishi replied, ''Veda means 'knowledge'—Veda means knowledge. Vedic means 'pertaining to knowledge.' Now when we say Veda is knowledge, we say Veda is total knowledge. Then what we present is the unified state of knowledge with the knowledge of all the diversified components of the unified structure of knowledge. By “Vedic Mathematics” we therefore mean mathematics approached in a holistic and unified way. The techniques shown by Swami Bharati Krishna show how this can be done: though mostly at an elementary level. This approach has however been applied with great success in more advanced areas of mathematics. On the basis of this understanding of the word ‘Vedic’ we can say that Bharati Krsna’s “Vedic Mathematics” is indeed Vedic. It brings out and uses the natural unified structures of mathematics, in contrast to the conventional approach which is fragmented. So even when reference is made to a particular Veda or portion thereof we cannot assume that the author is referring to actual physical texts. It is wrong then to believe that Vedic Mathematics is confined to the contents of ancient texts. That is not the full meaning of the word ‘Vedic’ or what Swami Bharati understood by the term. ‘Vedic’ refers to “the fountain-head and illimitable storehouse of all knowledge” which is unified and holistic in nature.